A native of New York, Dr. Strauss attended Cornell University as an undergraduate, then completed his veterinary degree at the University of Florida College of Veterinary Medicine in 1982. Since then, he has been practicing small animal and exotic medicine in the city of Pembroke Pines. In 1986, he opened Pembroke Lakes Animal Hospital, where he was the owner and medical director. In December 2005, he relocated the office to a larger facility at the current location, and renamed the office Weston Road Animal Hospital. 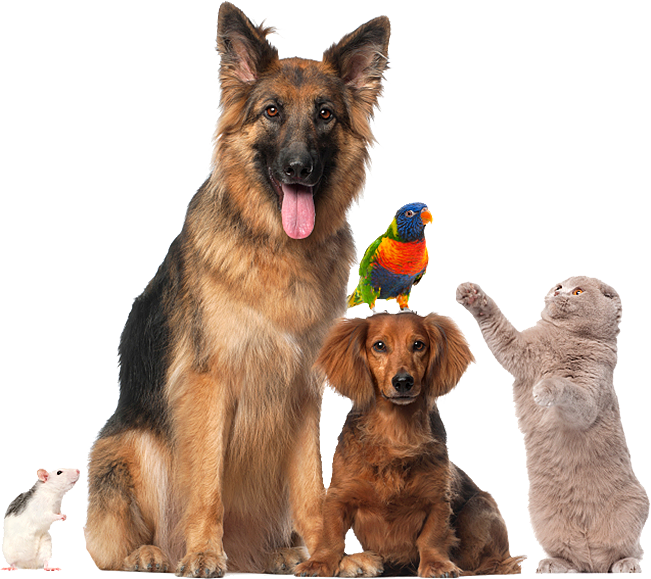 Dr. Strauss is a member of the American Veterinary Medical Association, the Florida VMA, the Broward County VMA, the Association of Reptile and Amphibian Veterinarians, and the Association of Avian Veterinarians. His primary areas of interest include internal medicine, exotic animal medicine, and animal behavioral problems. Dr Strauss's wife Judy, is an operating room nurse. He has two daughters the elder, Jamie, earned a Masters as a Physicians Assistant in Anesthesia from Emory University College of Medicine and works at multiple hospitals across south Florida. The younger, Melanie, attended the University of South Florida and is currently the proud owner and head instructor of Steve's House of Karate in Cooper City where she teaches martial arts and self-defense. The Strauss family shares a home with three dogs, an African grey parrot, and an indeterminate number of orchids. Dr. Feldt graduated from the University of Wisconsin - School of Veterinary Medicine in 1998. Upon graduation, he completed an internship at Garden State Veterinary Specialists in New Jersey. Since that time he has been practicing small animal medicine in Ft. Lauderdale, FL. In his free time he enjoys travel, fishing, and golf. He is a proud pet parent of Bruno, a French Bulldog & Sapa a Siamese Mix. Amy began her career in the animal industry at age 19 working with exotic animals in a sanctuary setting. Her intense love and devotion to caring for these beautiful creatures and educating others about animals fueled her passion toward veterinary medicine. She has been in the veterinary field for over 10 years. 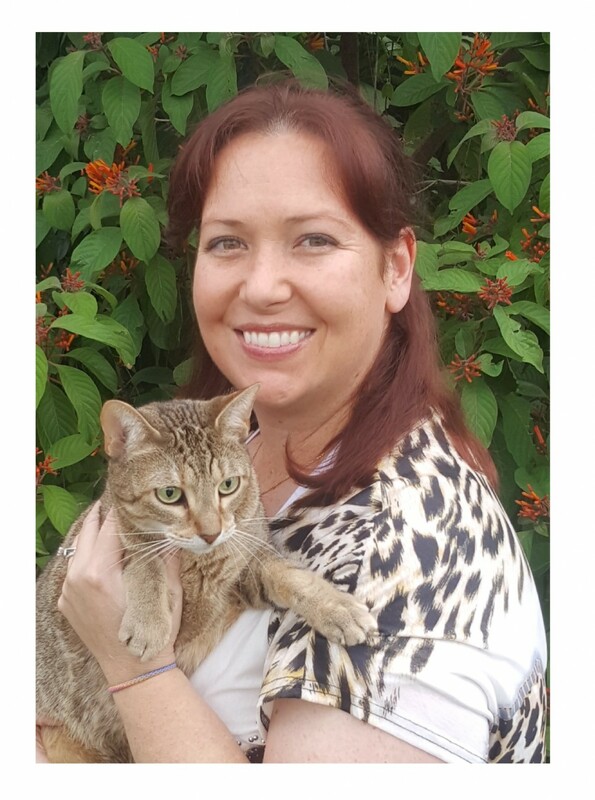 Her educational background includes a degree in psychology from Florida Atlantic University and a degree in Veterinary Technology from Penn Foster College. Amy has held various management positions in a variety of customer service oriented industries. In her spare time she maintains a household of rescued exotic animals and enjoys educating the public about her animals with an emphasis on responsible pet ownership. Colleen is a avid outdoor adventurer. She grew up enjoying nature and observing animals. This directed her career path into veterinary medicine. She has been gaining experience in all facets of veterinary medicine for the past seven years. She loves assisting in surgery and watching over our patients during anesthetic procedures and recovery. She takes extra special care to make sure our patients are warm, padded and comfortable before, during and after their procedures. Colleen also enjoys working with all types of animals. She is a pet parent to several different species including a dog, cat, and two types of snakes. Melissa has recently joined us from the Dominican Republic. She is bilingual and has a degree in Veterinary Medicine from her home county. Melissa has joined our team to learn more about our high standards and quality of care for our patients to better her own techniques. She is soft spoken and gentle with all her patients. She loves learning about advanced veterinary care and is working hard to become a licensed veterinarian in the U.S.
Chris is working with us part time as a veterinary assistant to better his skill sets as he works to obtain a degree in veterinary medicine. He learns quickly is a hard working, detail oriented individual. 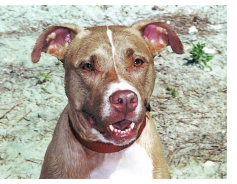 Born in 1996, Latte is a red-nosed American Pitbull Terrier. Originally adopted as our office guard dog, she was quickly promoted to blood donor. She had a blood type which is transfusable to all dogs of differing blood types. Latte saved numerous dogs in their desperate time of need. We at Weston Road Animal Hospital as well as the Strauss family were deeply saddened by the loss. Latte will be sorely missed by us and all those who were lucky enough to be touched by her presence. A sincere thank you from those who were saved by your blood transfusions. LATTE WE LOVE YOU AND MISS YOU! Amanda loves to engage with the clients. Her bubbly personality and genuine smile greet you as you walk in the door! She treats everyone like family and cares for the patients as if they are her own. She has loved taking care of animals in different ways throughout her life; from walking all of the neighborhood pets, to volunteering at local shelters, to interacting with clients at our hospital . She is a pet parent to a King Charles Cavalier named Lucy. Margarita loves animals and has been working in the veterinary industry for the past 15 years. She was born in Columbia and raised in Miami. She shares her home with her family and 3 four-legged children. Amya is an amazing 17 year old Miniature Pinscher. She is also the proud pet mom to Mia, a poodle and Chapo, a Shih-tzu. In her spare time she likes to take pictures with her camera and spend time with her four-legged children. Elyse has been working in the field of Veterinary Medicine for over 16 years. She loves that the medicine continues to evolve through technological advancements giving owners and their pets more time together with a better quality of life. Elyse loves engaging with our pet owners and enjoys being a part of their journey together. She is a pet parent to Sammy, a 12 year old Havanese. In her free time she spoils him by taking him on adventures to the beach and other locations with her family. Angie is the newest addition to our Client Services team. She has worked in multiple medical offices, both human and animal. She has excellent communication skills and is bilingual. Angie loves being around animals and has a menagerie of her own at home. Her warm smile and genuine concern for our patients are a wonderful addition to our team. 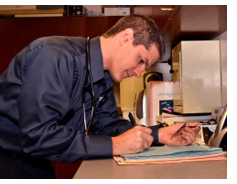 Andrew has been working in the Veterinary field for 13 years. He has worked in multiple job positions at different hospitals and truly enjoys spending time with the patients. He helps out wherever he is needed, but most frequently is found with a pair of scissors or clippers in his hands. His patience, gentle nature and creativity give his grooming clientele a "spa" like experience. Chris enjoys opportunities to work hands-on with the patients. He believes that every task has a lesson and enjoys learning. He owns and cares for a variety of reptile species in his spare time and continuously researches conservation issues, best reptile husbandry practices and information on captive animal enrichment. Gabriella has just recently stepped into the veterinary field. However, she has always been an animal lover. She enjoys the opportunity to build relationships and trust with our patients and their owners. She plans to continue in the veterinary field and hopes to become a veterinarian with her own animal hospital one day. Gabi loves working with exotic species. She is a pet parent to 3 small pets and has a special affinity for the Dachshund dog breed.